Since 1914, the Oklahoma Mortgage Bankers Association (OMBA) has been the State association representing the real estate finance industry, an industry that employs people in virtually every community in Oklahoma. OMBA invests in communities across the State by ensuring the continued strength of the State’s residential and commercial real estate markets; expanding home ownership and extending access to affordable housing to all Oklahoman's. We are an organization dedicated to helping our members manage their business. We actively advocate for our members, and have done so for nearly a century. OMBA promotes fair and ethical lending practices and fosters professional excellence among real estate finance employees through educational programs and providing industry information. We provide information to our members so they are better able to meet the needs of their customers. We host a variety of conferences and meetings that provide our members with the strategic tools, industry trends and resources they need to advance their business. Our investment in Oklahoma’s communities includes the time, service and hard work of mortgage bankers in virtually every aspect of real estate finance, in every community. We are the Oklahoma Mortgage Bankers Association! 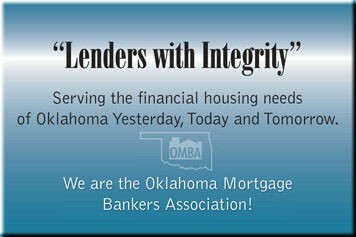 "Lenders With Integrity", Serving the Financial Housing Needs of Oklahoma Yesterday, Today and Tomorrow.